oil on canvas signed lower left. Title: An arched entrance to a street. 10″ x 14.25″( 25.40cm x 36.20cm). Noel Harry Leaver was born in Austwick, Yorkshire in 1889, but is better known as a Burnley artist, the town in which he lived and worked for most of his life. 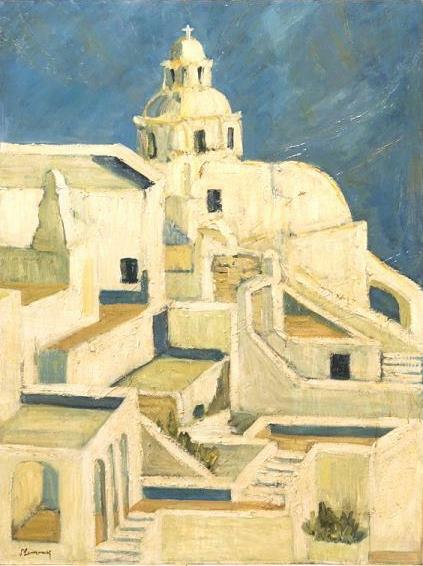 He is most famous as the painter of distinctive North African views or ‘Easterns’, although his work includes a much wider range of landscapes, town views, interiors and even still life. His earlier paintings are softer and looser than his later more accomplished works, but still show his fine understanding of detail and construction. He was particularly known for his treatment of skies. He was one of the youngest ever pupils of the Royal College of Art*, where he began studies at age sixteen. At the RCA he followed the classic training route doing modules in Architecture, Painting Modelling and Design passing first class in all. At the age of 21 he was awarded the College’s full Associateship (ARCA) and as top student won the first of several Travelling Scholarships. He used them to travel to visit Europe and North Africa. 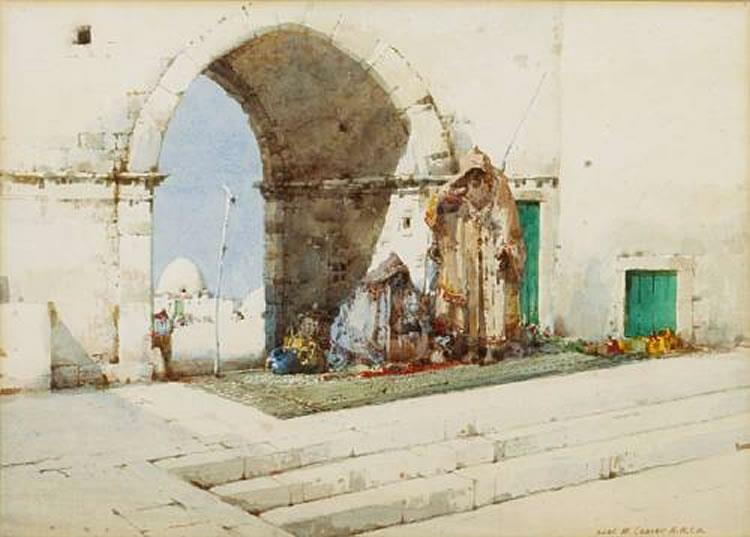 It was in this period that he started painting his North African scenes with vivid blue skies, arches and mosques for which he became most known. He also painted English and Continental townscapes and did many paintings of English cathedral cities and castles, including some internal church studies. Other areas were his landscapes, although these are less common in his later work and rarer still are his flower studies. Leaver returned from Italy to England in 1912 to take up the first of his teaching posts at Halifax School of Art where he worked until 1915. After this he taught at the Burnley School of Art up until the mid 1930’s. His earlier works in which he is still developing his style are usually signed in mixed lower & upper case Noel H LEAVER ARCA; these works are from the period 1920-1929. Few works earlier than this are found, and those that are often dated. In later life when his reputation was established he usually signed in capitals NOEL H LEAVER, dropping the ARCA. Works signed like this are most likely post 1929. At least forty-one of his works were exported to the USA via the agents Brown and Bigelow* in Minnesota during his later period of working. Artist Mazini was an Italian artist who lived in Cairo by the turn of the 20th century. 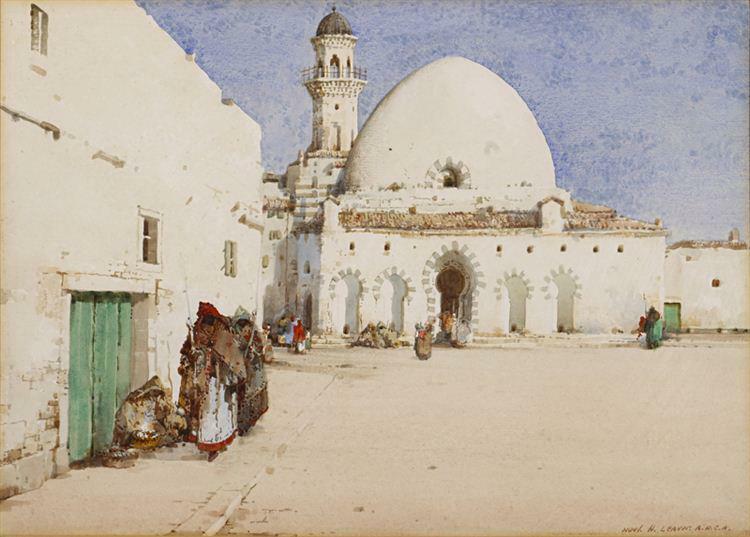 Known for his orientalist work of watercolor paintings depicting the Souks in Egypt. 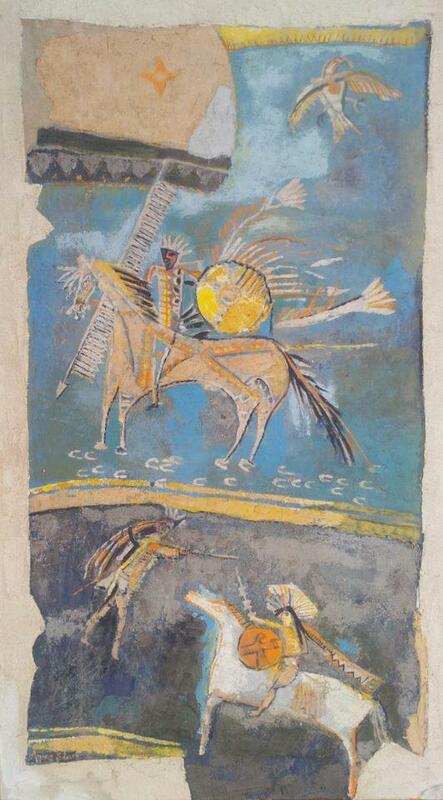 This example of his work measures 18×24 watercolor on paper. 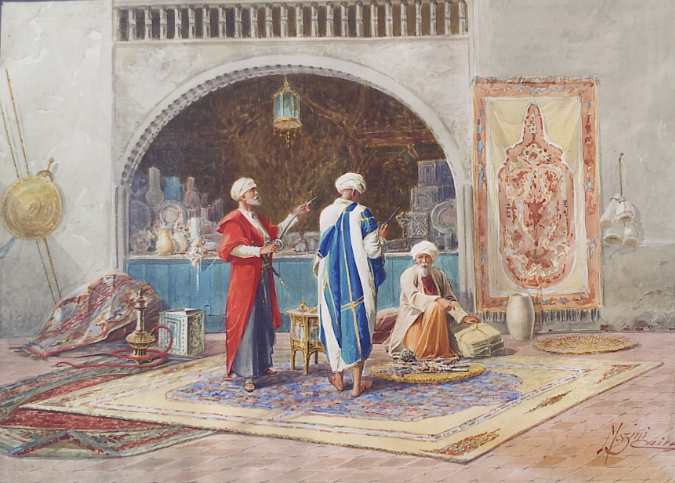 The painting is very unique in that, it has is hand carved frame in the Arabic style of the period. This painting is part of the Farhat Art Collection.